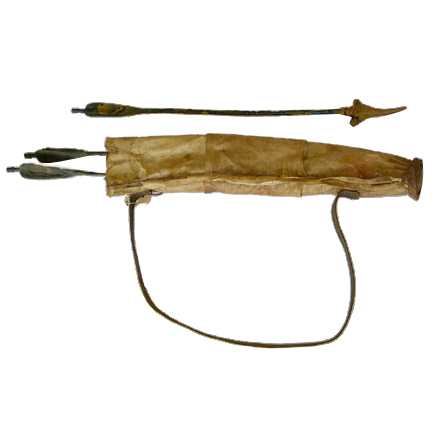 The prop quiver and set of 3 prop arrows were used in the 1995 motion picture “Waterworld”, starring Kevin Costner and Dennis Hopper. The quiver with attached leather strap is constructed from rawhide that was hand distressed by the film’s prop department to give it an aged appearance. The arrows are constructed of dense molded rubber with faux shark tooth heads and were hand painted and distressed for their use onscreen. The props were custom made for use on the production and are in overall good screen used condition. 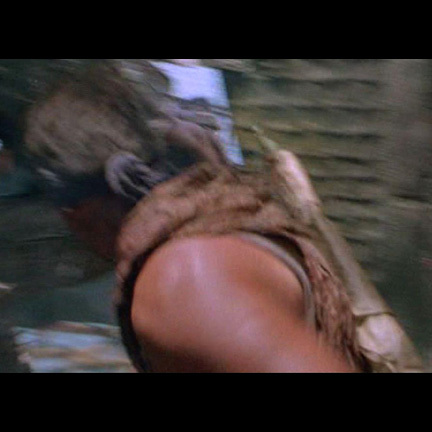 The items appeared during part of the action sequence when the Smokers attack the Atoll. “Waterworld” remains a cult classic amongst science fiction fans, despite being beset with problems and surrounded by controversy during its production. After several sets were destroyed by weather and due to various other production problems, the film went vastly over budget and star Kevin Costner was forced to pay out of his own pocket to complete the film. Despite its modest success at the box office, “Waterworld” held the dubious honor of being considered the most expensive “bomb” in film history when the picture was released in 1995 due to its overextended production budget. Accompanied by a letter of authenticity from the film's prop handler.